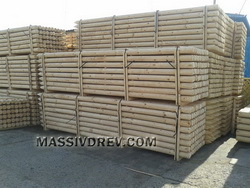 Diameter 5,6,7,8,10,12,14,16,18, 20 cm x length till 4 meters. Crowned, pointed or crosscut tops. We offer additional services: 1. Holes drilling for fencing poles according to customers’ drawings, 2. Autoclave impregnation with green Tanalith E (without chromium and arsenic) HC III or IV, 3. Kiln drying. Please contact us or send your specifications for further details.